Canada's Prime Minister Justin Trudeau has cancelled a visit to Brussels because of Belgium's deadlock over the troubled EU-Canada Ceta trade deal. An EU-Canada signing ceremony had been planned for Thursday. Its cancellation is a big setback for the EU, with Belgium's Wallonia region preventing the 28-nation EU from signing Ceta. Belgium's federal government is holding further talks with Walloon politicians. It took seven years to negotiate Ceta, the EU's most ambitious trade deal yet. The Ceta wrangling has raised new concerns about future UK negotiations with the EU on a Brexit trade deal. Under Belgium's federal system, the national government cannot sign the deal unless all six Belgian parliaments approve it. French-speaking Wallonia, a staunchly socialist region of 3.6 million people, has led objections to the deal, demanding stronger safeguards on labour, environmental and consumer standards. A major stumbling block is the plan to create new commercial courts to handle disputes between companies and national governments. Wallonia fears they would give too much leverage to multinationals. It also wants more protection for Walloon farmers, who would face new competition from Canadian imports. Is Ceta a good model for Brexit? Reality Check: Could Walloons sink a Brexit trade deal? The other 27 EU governments want to sign Ceta (the Comprehensive Economic and Trade Agreement), and European Commission President Jean-Claude Juncker said he was optimistic that the Belgian blockage could still be resolved. 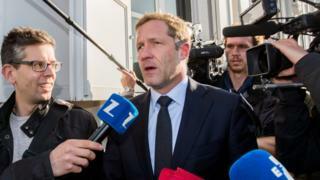 As Thursday's talks got under way Wallonia's Socialist Prime Minister, Paul Magnette, said "a few legal issues" remained to be cleared up, but "a lot of progress" had been made. A Belgian deal would still have to be approved by the other 27 EU governments.